The collar will log a GPS point 3 times or 4 times per day of the location of the cheetah and additional info such as the activity of the cheetah. The activity and signal strength is transmitted to the base every 10 min. Hourly this info is downloaded onto the Internet Server. The collar is fully programmable from a remote control point and new monitoring instructions such as shorter intervals or longer intervals can be reprogrammed for the monitoring of the cheetah. The battery lifespan is about 24 months. The range of the UHF transmitter is +/- 5km to base station subject to terrain. 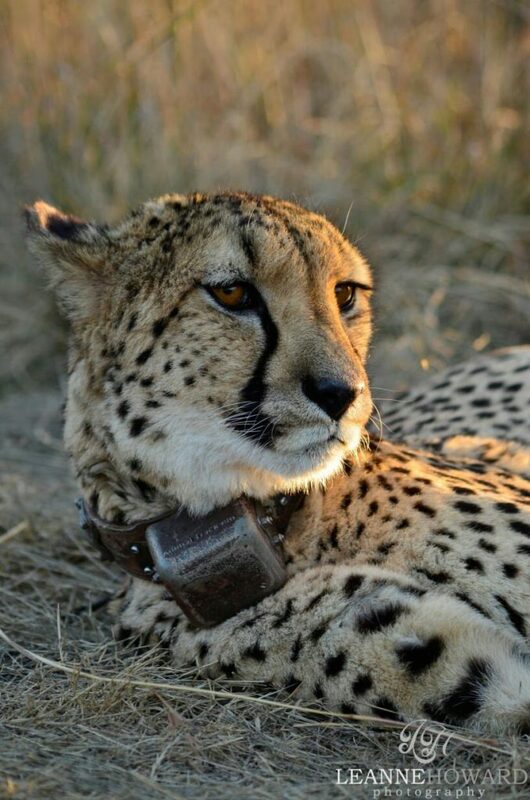 In addition to the GPS/ UHF facility there is also a VHF beacon transmitter on the collar, which will constantly send a pulse so that the cheetah can be monitored by means of a VHF receiver and antenna. The range of the VHF transmitter is 5 km, subject to terrain. area and relays all data received from GPS ANIMAL MONITORING DEVICES to the BASE STATION for distribution to the user. Users will receive real time alarms by means of SMS and missed calls and all data are made available through a secure web interface. Alarms will include abnormal animal activity (abnormal HIGH activity when chased or threatened and abnormal LOW activity when stationary for too long) or if the rhino moves into or out of a specified zone (breaking fence). The same ANIMAL ANIMAL MONITORING DEVICE that is used for security purposes, are implemented for research applications. The system layout that is used in the Security System application, can also be used for researchers to download and access behavioral data. Base stations can be erected at strategic points in the research area and as soon as the rhino moves into coverage of the BASE STATION, the data will be downloaded to be accessed through a secure web interface. Alternatively researchers can be supplied with a manual download console. This enables data to be downloaded from the rhino by means of a manual field download technique or by plane. Animal Track-em has had great success by downloading data by means of a model plane with a build in manual download console. simultaneously for multiple tagged rhinos from ground or air and will take about 5 minutes to receive the coordinates.